All my life I wanted to be a flight attendant. The thrill of flying from one destination to the next, to exotic destinations like Portland and Omaha (I wanted to be a domestic flight attendant) on an airline with an endless supply of assorted juices and sodas and trying to pour scalding hot coffee during turbulence delighted me in a way I can’t fully express. In those pre-adolescent years on days-long station wagon road trips with the family I would practice steward-ing by serving my younger siblings honey roasted peanuts in the backseat. As we left each rest stop in winter months, I demonstrated how to secure a seatbelt and how to roll down the window for oxygen in the event of a loss in cabin pressure. “First ventilate for yourself and then for young children,” I would announce when the baby needed a new diaper but there was no place to stop for 52 more miles. What’s remarkable is I had never been on a plane and I had never seen a flight attendant in action. This all just came naturally. You could say I was meant to be a flight attendant. When I was 12, the local grocery store offered a sale on airline fares. For $150, frequent customers could purchase a round trip ticket to anywhere in the continental U.S. My good parents, struggling to understand their first pubescent child, gave the green light for me to fly solo two time zones away into the arms of adolescent-parenting veterans, their own parents. 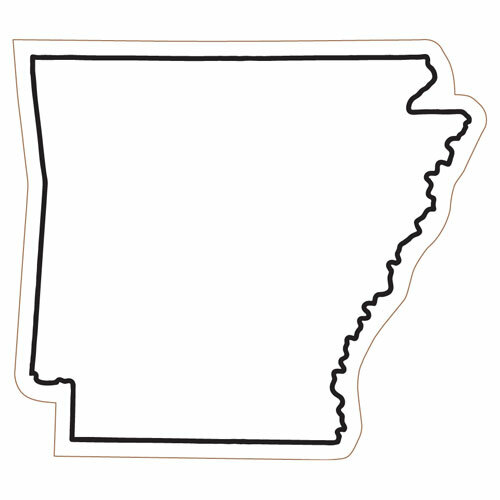 When I tore out the piece of notebook paper that would track my progress towards earning $150, it looked exactly like the State of Arkansas. My only challenge was to raise more money than I had ever possessed in my young life: one hundred and fifty big ones. In today’s dollars, that’s about $4.2 million. In my excitement to get started and track progress, I ripped a very uneven piece of notebook paper and drew 30 boxes that each represented $5. The torn paper looked a lot like the State of Arkansas. Interestingly, this was only four years before a U.S president would be elected from that very state! Coincidence? It is now obvious even to me that I should not be blogging anymore. For each $5 earned, I would fill in a box on the chart. When I earned anything less than $5 I divided each little box five different ways and filled in a line for each of the dollars earned. I used blue ink, which meant no screw ups, and no spending. Man, I loved that piece of paper. It represented freedom, growing up, responsibility, goal setting, and another step closer to becoming a flight attendant. In just a few months selling newspapers door-to-door, delivering the paper, pulling weeds, babysitting, and performing other odd jobs for kind neighbors, I earned the $150. The day of my first commercial airline flight finally arrived. Without going into great detail about that first flight, I will only say that after experiencing life in the sky, I was more certain than ever: I had a future in flight attendance. Fast forward four years to age 16. President Bill Clinton is now in the White House and Kurt Cobain is dead. Still hanging on to my dream and learning more about flight attendant job qualifications, I passed my 5’11” father in height. That’s when I began to worry that I would exceed the 6’1″ drop-dead highest height requirement allowed by the major airlines (TWA’s requirement was 6′ even and we all know what happened to them). I measured my height daily during those years. At 19, I hit my paranoia peak when I grew to 6′ and a half inch. Almost magically, I stayed exactly at that height and felt confident I was finished growing. This job in the skies was going to happen. I was going to do this. I patiently awaited my 21st birthday, the youngest I could be admitted to flight attendant training. First, I had to wait for an airline to recruit in my city. Three months later, on a surprisingly warm February morning, the recent snow melting away, I took a bus to the interview. As the bus traveled to the airline training center, I walked up and down the aisle, pretending to check that seats were in their upright position and luggage was properly stowed. “Are you training to be a flight attendant?” A perceptive passenger asked as we approached the airport. I breezed through the interview. It was surreal. Yet so real. And also surreally real. Just not surEltonJohn real, although my interviewer admitted he was a big fan. The first round, second round, and then third came and went. 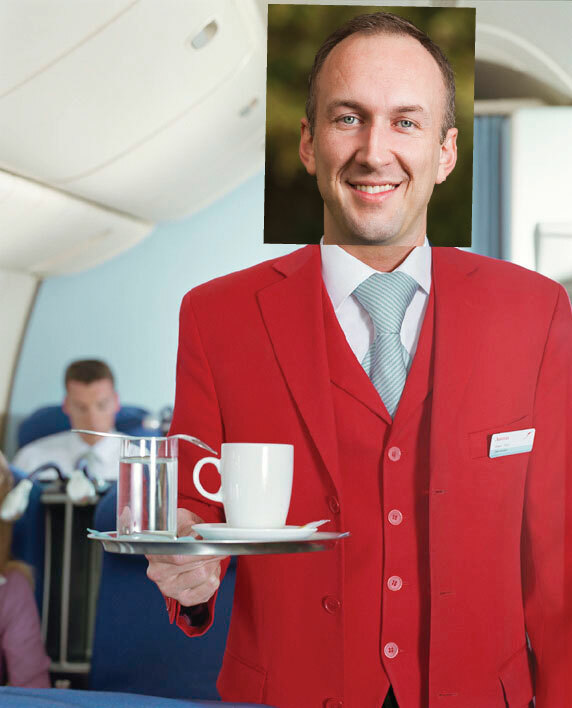 The selections process was brutal, but I eventually received a formal offer to serve as a flight attendant for Delta Airlines. Because of my height, charm, years of experience in a station wagon (I was told), and incredibly good looks (I told myself), I was assigned to the PHL – ORD and ORD – DFW on a Delta 727-200 which accommodated flight attendants of my height. I was told with excellent performance reviews I could move to a 747 by the time I was 30. By 40 – I could wear the coveted red suit. Two weeks before my first flight they asked that I turn in my training gear, get sized for my official Delta uniform and go through one last round of physical checkups. I went straight into my training exit interview and Ms. Kirschner asked that I sit down. She didn’t have to say any more than that. 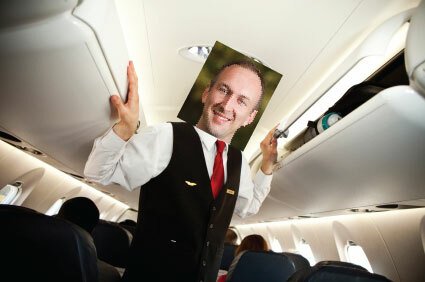 At six feet, one and a half inches, I knew I was too tall to be a flight attendant on anything but a cargo plane. I knew it was over. I would never wear the red jacket. I would never fly to Omaha. I would never point to the nearest exit or wear a deflated life preserver around my neck. I was too tall to serve the cause. I was too tall to serve the coffee. And I have nothing against flight attendants. 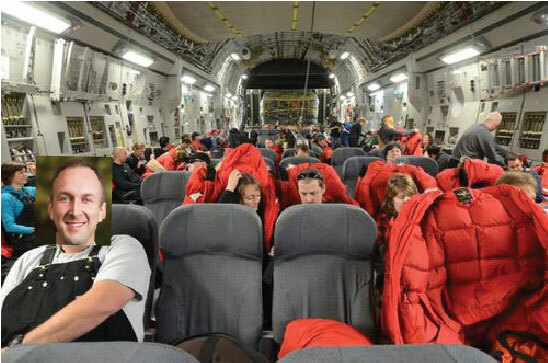 Life as a cargo plane flight attendant.